Well, the wait is over. 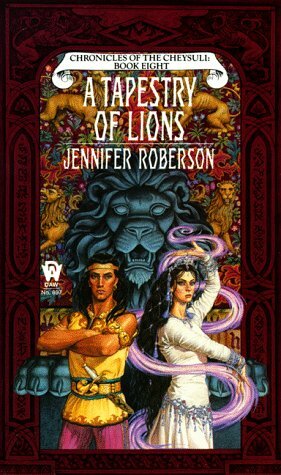 Today’s the day I’m going to talk about Kellin from The Chronicles of the Cheysuli, my first “literary crush”. I’ve mentioned him in previous posts, which you can find here and here. You can’t tell in this picture, but Kellin’s eyes are green—this is what started my obsession with guys with dark hair and light eyes (particularly black hair and green eyes—hello Logan Conner!). Now, I don’t want to ruin the book(s) for everyone, but I’ll do my best to summarize Kellin sans spoilers. Kellin is first introduced at the end of the previous book, called “Flight of the Raven”. At the beginning of “A Tapestry of Lions”, Kellin is ten years old. His grandparents and his great-uncle have raised him since infancy. A tragedy prompts a radical change in Kellin’s personality. Fast-forward ten years. Kellin is now an adult and has turned his back on his heritage and the prophecy that has been the focus of his people for generations. The only thing he hasn’t turned his back on is his title of Crown Prince, although he ignores the responsibilities that come with it. At this point, Kellin’s become cocky, self-absorbed—you know, all my favorite qualities in a fictional hero. He’s a drinker and basically a man-whore (neither quality are ones that I like) but there’s still something redeemable about him. It must be the whole tortured thing. His family has spent generations serving a prophecy that Kellin is the last “link” in. He’s the one who’s supposed to fulfill it—but he’s doing everything in his power not to. I don’t want to give away the ending, so I won’t tell you if Kellin ultimately fulfills the prophecy or not. You’ll have to read it for yourself. As I mentioned before, Kellin was one of my inspirations for Logan Conner from my Shadow Imperium series. The other was Darien Shields (Mamoru Chiba, to use his Japanese name) from Sailor Moon—I know, I know . . . I have a slight anime obsession. But more about that (and Darien) next week! I’m back with Fun Fact Friday! Today, I’m going to talk about something that’s been an inspiration to me: my grandmother’s ring. Please excuse the poor photo. I couldn’t find my camera and had to use my phone. Now, this ring is just a piece of costume jewelry. It reminds me of a signet ring, which is probably how my Nana wore it (she had really tiny hands!). It may not seem significant, but it’s the only thing of my Nana’s that I have. 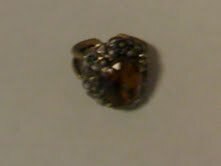 I like to pretend that she bought it after I was born, because the stone resembles my birthstone, topaz (or citrine). This ring is what inspired Raena’s citrine necklace in the Shadow Imperium series. Citrine is traditionally used for protection, which is why the necklace is given to her. Several of my works-in-progress also involve amulets or signets that serve various purposes. Now, I’m not particularly superstitious, but I do like to wear this ring when I write. It sort of makes me feel close to my Nana, which is comforting. And I won’t necessarily say that it’s good luck or anything, but I did wear it to my math final last month . . . and I got the highest grade in the class. Of course, that could have been due to my seven-hour-long marathon study session the day before, but who knows? I’ll be back with some more “fun facts” next Friday! Don’t forget to come back tomorrow for the next installment of “Bemused”!